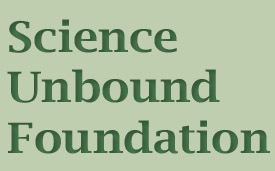 The Science Unbound Foundation has announced its 2017 award winners for best scientific papers by investigators at Indiana University-Bloomington, the University of Alabama at Birmingham (UAB) and the New York Obesity Research Center at Columbia University College of Physicians and Surgeons, and Albert Einstein College of Medicine. The awards, plaque and cash prizes are for works published in 2017 in the areas of obesity, nutrition, statistics and public health. 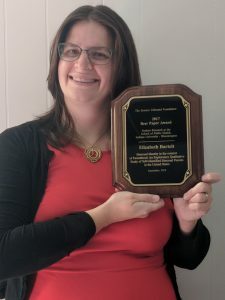 Elizabeth Bartelt, predoctoral scholar at the Indiana University School of Public Health-Bloomington, was awarded best paper by an IUB-based student investigator in the area of public health. Her paper, “Bisexual Identity in the Context of Parenthood: An Exploratory Qualitative Study of Self-Identified Bisexual Parents in the United States”, was published November, 2017 in the Journal of Bisexuality, https://doi.org/10.1080/15299716.2017.1384947. 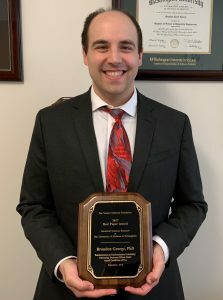 Brandon George, PhD, now an assistant professor in the Thomas Jefferson University Jefferson College of Population Health, and was formerly a postdoctoral researcher with the UAB Office of Energetics. 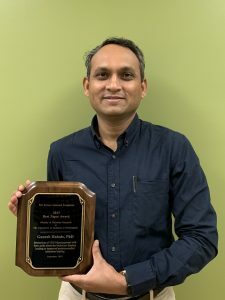 He was awarded best paper by an UAB-based investigator in the area of statistics. His paper, “Randomization to Randomization Probability: Estimating Treatment Effects Under Actual Conditions of Use” was published April 13, 2017 in Psychological Methods, http://dx.doi.org/10.1037/met0000138. 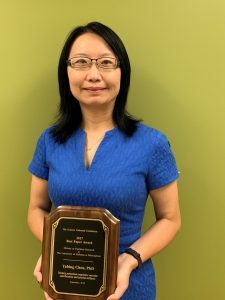 Yabing Chen, PhD, Professor in UAB’s Department of Pathology and Ganesh Halade, PhD, Associate Professor in the Department of Medicine – Cardiovascular Diseases Division, were jointly awarded best paper by UAB-based investigators in the area of obesity or nutrition. Dr. Chen’s paper, “Dietary potassium regulates vascular calcification and arterial stiffness” was published in the October 5, 2017 issue of JCI Insights, https://doi.org/10.1172/jci.insight.94920. Dr. Halade’s paper, “Interaction of 12/15-lipoxygenase with fatty acids alters the leukocyte kinetics leading to improved postmyocardial infarction healing” was published in April 2017, https://doi:10.1152/ajpheart.00040.2017. 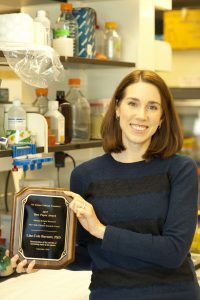 Lisa Cole Burnett, PhD, assistant professor at Columbia University and the New York Obesity Research Center, was awarded best paper on obesity-related research by an investigator affiliated with the New York Obesity Research Center. Her paper, “Determination of the half life of circulating leptin in the mouse” was published in the March 2017 issue of The International Journal of Obesity (London), https://doi:10.1038/ijo.2016.238. 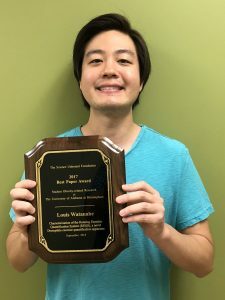 Louis P. Watanabe, MS a student in the UAB Department of Biology, was awarded best paper for his paper, “Characterization of the Rotating Exercise Quantification System (REQS), a novel Drosophila exercise quantification apparatus”. The paper was published in the April 19, 2016 issue of PLOS One, https://doi.org/10.1371/journal.pone.0185090. The institutions named in the awards were selected on the basis of their demonstrated strength at promoting careers of young investigators in the areas of obesity, nutrition, statistics and public health.